Every time Bob’s puts on a musical I fall in love with Linda’s raspy, but soothing voice. The Bleakening is this season’s two-part Christmas episode that follows the family as they try to recover their stolen Christmas ornaments. Linda interrogates every person who came to her Christmas party in a desperate attempt to get back her precious goods. This episode got everything right from the songs, the plot, Linda’s cries, and especially, the opening number where Linda is wrapped in a blanket serenading Bob with the promise of her Christmas Dream. I have watched this episode again, and again because it gets funnier with every play. Watch this episode for free on fox.com! Like many fans of the show, I look forward to the holiday episodes as they end up being some of my favorites from every season. This episode is no different! The family is doing Thanksgiving at home, but this year, Gayle joins the evening and ends up messing up Bob’s plans. The weather prevents Gayle from being able to drive to the Belcher’s and she is unable to walk, so Bob has to drag Gayle and her cat all the way to his kitchen in a snow tube. I was laughing this ENTIRE episode, but I stinkin lost it when Linda and the kids scrubbed in to perform turkey surgery after Linda ripped the legs off! Whenever I need a good laugh after a long day at work, this is the episode that I turn to. This episode begins with Linda and the family going Caroling, but Bob has to deliver food to his landlord and cannot join them. His landlord convinces him to stay and participate in a Gingerbread House Competition with the understanding that he must lose. Bob ends up getting annoyed and tries to win the Gingerbread House contest to get back at his landlord. My favorite part of this episode is that it ends with all of the contestants, but Bob, shooting at everyone’s gingerbread house. At the same time, the caroling is not going very well and they end up at a “creepy” house with a man who does not make the best first impression. I love this episode so much because of the chaos that erupts from both storylines. This episode may be VERY new, but Louise really sold this episode for me and it takes a spot in my top six. The kids are tasked with creating gifts for their grandparents, but Louise goes on a hunt to find the lost pottery room to avoid making gifts. The amount of energy she spends finding the lost pottery room is not nearly as much as she would have used to make the gifts herself. She tracks down a student from the pottery class from the 80’s to find the location of the room, and has to saw through a locker to enter the abandoned space. In the end, she ends up making the presents herself, but not before they have a very exciting adventure. The procrastination that Louise presents is what makes this episode so funny and a top episode in my heart. Let me start off by saying… I love this episode! Bob’s landlord increases rent to all of his properties and the tenants get together to fight this change. When they confront the landlord, he proposes to reduce the rent by half, for one tenant – the tenant that stays dry during a water balloon contest. Every tenant, friend, and child is fighting for a reduced rent in a backyard battleground. 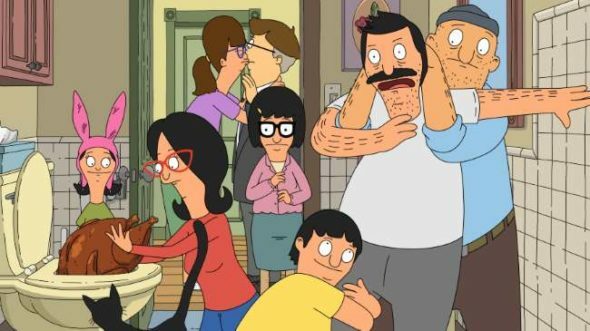 Since Bob started the riot, he is the prime target, and as Louise said, “You’re a high-value target, in a low-value body.” The hunger from the community to soak Bob had me at the edge of my seat rooting for the Belchers! I was, of course, jealous of Linda and the delicious snacks she found from the sidelines. She knows how to participate the smart way. Linda’s parents are staying with the Belchers and Bob would do almost anything to avoid being around her parents. After discovering the large crawl space, Bob tells the family that he is stuck to avoid coming out and spending time with his in-laws. Of course, in the end, he actually got stuck and it takes a lot of effort to get Bob out. I love this episode because it is relatable to so many people who would probably do the same thing to avoid specific family members. I know I would hide in a dangerous crawl space to avoid a few people What say you? In the End, What Do You Think? The Belcher’s visit my television screen often, and I hope that you are also keeping this wonderful family company. There are so many great episodes to choose from, but these are the episodes that bring me joy and make my sides hurt from laughing. If you have not started watching the show, you can start watching from any episode. On the plus side, all episodes are streaming on Hulu! Give it a shot and you won’t look back. For those that are familiar with the Belcher’s, how does my list compare to yours?